Bill Nye -- The Science Guy -- proved he's much more than a Disney channel infotainer in his debate against Ken Ham, the head of the Creation Museum, last night. "The Bible is the word of God," Ham said. "I admit that's where I start from." That's pretty much the only argument Ham could make. To his credit, Nye didn't try to embarrass him by asking if he truly believed that the first woman was created from a man's rib, and the entire human population of the planet owes its origin to a magic apple and a talking snake. Creationists have one argument -- that the Bible contains all that any person ever needs to know about the workings of the universe, despite empirical evidence otherwise. Ham's position was no exception. When asked by an audience member about the origin of atoms and subatomic particles, Nye admitted that scientists were still exploring that question, while Ham stuck to the tried-and-true position that there is one "book" that contains all the answers we'll ever need ... yup, he's not talking about Origin of Species. The one-book believers also like to point out that evolution is just a "theory" and therefore should not be accepted as fact or taught in science classes. 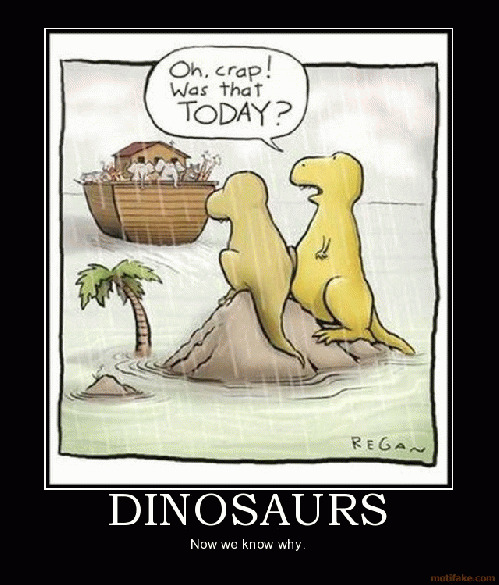 But as Nye (among others before him) pointed out -- where is the proof in the creationists' theory? Another questioner asked if there was anything that would change either of their positions. Ham immediately answered "no" while Nye answered "just one piece of evidence" that would support the idea that God created our 6,000 year old universe. One man with a closed mind, one with an open one. So typical. "Unless you want to argue that God designed the universe to look older than it really is -- that is, that God wove dishonesty and deceit into the very fabric of his creation -- then it seems to me that young-earth creationism has a big problem on its hands." Hard to argue with the Hubble. Or Einstein, Stephen Hawking, and the rest. "'It's going to create a lot of discussion. I think that's very healthy,' said Ham, in reference to the raging scientific debate over whether evolution actually happened. 'In many ways aggressive atheists have shut down that discussion.' But, Ham continued, 'the public wants to hear about... origins. Fortunately, Nye has given them that chance. "'When I asked whether the debate would bring any financial perks, Ham hastened to talk me down. 'The ticket sales won't come to half the cost of the debate,' he explained. The publicity, though, may be priceless. The last time Ham gained national media attention, it was for his failure to raise enough money to build the enormous Noah's Ark theme park he's been planning as an accompaniment to his slick creation museum. This time, he gallops onto the national stage as defender of the faith -- a stance that may open some pocketbooks. Perhaps Ham will dedicate a plank in the replica ark to his bowtied benefactor."